The Cuisinart Chef’s Classic Stainless Steel Cookware Set comes with 10 useful, stainless steel pots and pans including 2 skillets, a saute pan, 2 saucepans and a stock pot. Made from sturdy stainless steel, the set contains an aluminum base to ensure even and fast heating. The Cuisinart Chef’s Classic Set is reasonably priced and offers enough versatility for the home cook to make any type of meal – big or small. Read the rest of my in depth review to learn about what features this cookware set offers and what other consumers have had to say about it. 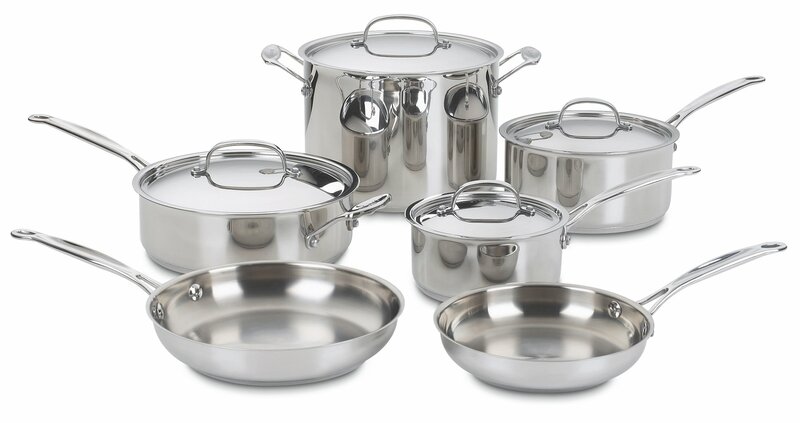 The Cuisinart 77-10 Cookware Set is made of stainless steel with an exclusively designed encapsulated aluminum base. In plain English, that means that the set has the durability and non-reactive benefits that stainless steel offers, with the great heat conductivity and even heat distribution that aluminum offers. All exterior parts of this cookware set are stainless including the pots and pans themselves, the handles and the lids. The first thing you’ll notice about the Cuisinart Chef’s Classic Stainless-Steel Cookware Set is that the pieces are nice and shiny – with a mirror finish inside and out. The handles are solid and riveted to their respective pots and pans. The lids are also stainless steel and have the same mirror finish. The Cuisinart 77-10 is really a classic looking set; however whether your kitchen is of modern or classic decor, this cookware should fit in nicely. It’s pretty enough to display openly, and even has looped handles should you have a pot rack to hang it from. The stainless steel lids that come with the Cuisinart 77-10 Cookware Set are designed to fit tightly, locking in flavor and moisture. They help to eliminate loss of nutrients, texture and flavor that can happen with poor fitting lids. The tops of the lids have stainless steel, wide fitting handles that are easy to grip and lift even while wearing oven mitts. While many cookware set manufacturers urge you to hand wash pots and pans, Cuisinart claims that the 77-10 Stainless Steel Set can be washed in the dishwasher without any negative effects. This is a huge plus for cooks that love to cook but hate clean up! A really nice feature of the Cuisinart 77-10 Cookware Set is the tapered rims on the pots and pans. With the slight tapering, it’s easy to pour cleanly without dripping all over the stove or counter. The Cuisinart Chef’s Classic Stainless-Steel Cookware Set is oven safe up to 500° F. Cook on stove top, in the oven, or under the broiler. The set is even freezer safe for easy food storage. This cookware set comes with a Lifetime manufacturer’s warranty from Cuisinart. 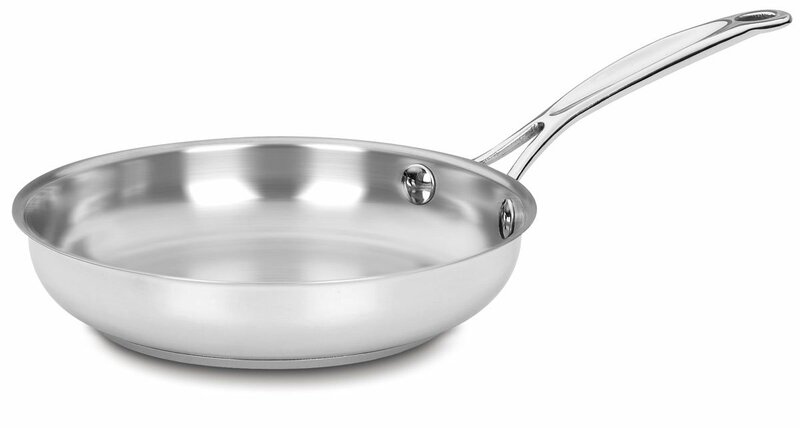 Stainless steel is a great metal for cookware because it’s incredibly durable. Stainless is not only resistant to scratches and dings, but it’s also a non-reactive metal, meaning the flavor and color of your food won’t be affected by the metal. With proper care, there’s no reason you can’t get years of use from the Cuisinart 77-10 set. The Cuisinart 77-10 set is dishwasher safe. Normally, I recommend hand washing all cookware to get the best life out of it. In this case, however, consumers have reported washing the set in the dishwasher without having any problems. Many of the comments are very mixed with some people questioning the quality of the set. On the positive side, reviewers that liked the cookware liked the appearance, felt the weight was good and the pieces were sturdy, and confirmed that the stainless steel pots and pans heat up quickly and evenly. One reviewer commented that even though the handles are metal, they actually do stay cool during cooking. This is likely due to the long length. This reviewer also pointed out that the included lids will work for both the pots and both the frying pans, and the lids all fit well. Another reviewer gave a very detailed review of the set and ultimately “graded” the Cuisinart 77-10 set a B. This consumer was pleased with the appearance and the solid, sturdy feel of the pieces. He was happy with how the pans heat up and pointed out that when Cuisinart says lower heat settings should be used, they really mean it. The aluminum bottoms do heat up quickly. While he experienced some food sticking, overall he felt clean up was relatively easy. He did attempt to put them in the dishwasher, however, and ended up with a purple staining on the bottom. After this, he decided hand washing the pots and pans would be best. The negative comments about the set seem to be relatively new, which leads me to wonder if something has changed in the design of this Cuisinart stainless steel cookware set over the years. Most of the complaints center on the quality of the set. Many people complain that it’s very easy to burn food. Without knowing the heat settings and cooking techniques that these reviewers used, it’s hard to say whether this is “user error” or the pots themselves. No doubt, there is a learning curve when using stainless steel. Stainless steel cookware should be used with lower temperatures, and it’s necessary to use some type of oil or lard to help keep food from sticking. Other complaints about quality referred to staining or pitting, breakage, warping, and spotting. Again, without knowing exactly how the pieces were used, it’s really impossible to know if the damage could have been prevented; however, one reviewer points out that she has an older version of the same model from Cuisinart, and that set does not have the same issues as the current version. This really lends itself more to an issue with the cookware, and not the people using it. Before rushing out to buy this set, I would strongly recommend reading some of the reviews at Amazon.